F&W’s Lettie Teague, who often brings her own wine to restaurants, discovers that corkage fees can be as little as $10 or as much as $250. What is it worth to BYOB? That got me thinking. When is a high corkage fee really worth paying? What could you get for $250 that you couldn’t for, say, $25? That’s the average cost of corkage nationwide (it’s about $10 more in New York City). I like to bring my own wines to restaurants every now and again—sometimes it’s because the wine list is overpriced and/or uninteresting, and sometimes (admittedly less often) it’s because I have a really good bottle and, like The Collector, I want to drink it with food that’s equally great. Of course, there are plenty of places that don’t permit people to bring their own bottle—because they regard corkage as revenue lost (though $250 seems more like found money to me) or because it’s actually against the law. Texas is one of a few states in which bringing your own wine to restaurants can be illegal, as I discovered when I was in Dallas recently. I’d called to make a reservation at Fearing’s, and when I asked about corkage, the hostess informed me it was not only illegal but perhaps even prohibited by the state’s Board of Health. “I think that might be a health-code violation,” she speculated. “I know we don’t allow outside food because of the health policy. It’s probably the same with outside wine.” Cabernet as contaminant? That was certainly a novel prohibitive cause. In cities like San Francisco that are close to wine country, bringing wine to restaurants is the cultural norm, and woe to any restaurateur who decides otherwise. Consider the case of San Francisco chef and restaurant owner Craig Stoll, who banned people from bringing their own bottles to Pizzeria Delfina. His move provoked a passionate outcry; indeed, the city’s residents responded as if Stoll had violated some civic code. The San Francisco Chronicle ran a half page of letters from readers about Stoll’s decision, with several writers denouncing his policy—though others actually defended it. If you bring a bottle of American wine to Charlie Palmer's DC steak house, the corkage is free; international wine, however, will run you $25 per bottle. Alas, Palmer isn’t as patriotic elsewhere. At his restaurant Aureole in New York City, for example, corkage costs $50 a bottle. “Even for American wine?” I asked Wilma Luciano, Aureole's reservationist. “Yes,” said Wilma, clearly wondering what I had in mind. “But at Charlie Palmer Steak, American wine is free,” I protested. “That’s kind of eccentric,” Wilma replied. Aside from a waiter willing to open and pour from a bottle, what other services can one expect to come with a corkage fee? 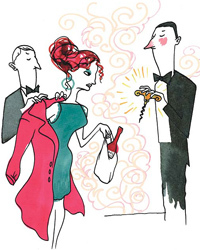 And what does a place with pricey corkage provide that one with cheap corkage does not? I decided to try three different New York City restaurants, each with a different “level” of corkage, to see if more money meant a commensurately better time. My cheap-corkage experiment took place at Metro Marché, a brasserie located in the Port Authority Bus Terminal. The restaurant is more attractive than its address might suggest, the food is surprisingly good—and the corkage fee is one of the cheapest in town: $10 a bottle. I brought a very good bottle (as I did every time), and the waiter seemed quite pleased by the label: 2005 Christian Moreau Les Clos Chablis Grand Cru. “A grand cru,” he remarked excitedly. “That must be good.” I assured him it was and offered him a taste. “The 2005 vintage was a great one for Chablis,” I said, “And Moreau is considered a leading producer.” We both admired the intense, minerally white, though I thought it was still a bit young. (A grand cru Chablis can take years to develop.) The waiter nodded and promptly finished his glass. The wine was also a great match with the food, especially the crab cakes. Did other people ever bring their own wine? “You might be the first,” the waiter replied. I found it hard to believe that no one else had packed a bottle—not just because the corkage was so cheap, but because just about everyone in the restaurant had some kind of luggage parked at their feet. Certainly the wine list at L'Impero was more sophisticated than the one at Metro Marché, and the glassware and food were a step up as well; my gnocchi with wild mushrooms was particularly superb. In fact, the experience was definitely worth an additional $35—so much so that I thought my friend The Collector might even consider making it one of his regular haunts. He would save more than $200 on corkage, though he wouldn’t like the one-bottle limit. My corkage experiment had been quite positive so far; the fees had been reasonable and no one had seemed anything but pleased to see my bottle and me. But how would I be received at Jean Georges? After all, Jean Georges is a four-star restaurant with a pricey wine list and a rather steep corkage fee ($85), which seemed designed to discourage people from bringing wine. With that in mind, I brought one of my very best bottles: a 1990 Dom Pérignon rosé. It’s a remarkable wine, and it’s quite hard to find. Indeed, according to Jean Georges’s wine director, Bernie Sun, this particular DP rosé is just about impossible to buy and would cost $800 to $900 on his list—if he could get it. Jean Georges turned out to be my best experience. The food and the wine service were both equally great. Our waiter not only happily accepted my bottle but noted it was “a few degrees too warm” and immediately plunged it into a bucket of ice. In fact, he paid such careful attention, I began to think it was a $900 wine. It even tasted that good. Bernie, who stopped by for a glass, agreed. “It’s a privilege when someone brings in a great bottle,” he said graciously.